This dissertation presents the findings of an investigation of adnominal possession and ditransitives on the basis of data from Modern Greek. The general thesis of the dissertation is that possessive DPs constitute nominal counterparts to ditransitive constructions. Greek ditransitives consist of double object constructions and prepositional dative constructions, which are analyzed as low applicatives; the former with possessive properties, the latter with locative. Double object constructions, unlike prepositional datives, are associated with restrictions concerning animacy, affectedness and number features on the recipient. A-movement (a)symmetries in ditransitives are argued to reduce to underlying phase structure and the movement properties of the applicative head. 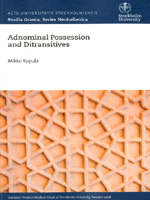 The dissertation shows that the possessive/locative dichotomy associated with Greek ditransitives is reproducible in the realm of adnominal possession. Prenominal possessors pattern both syntactically and semantically with dative recipients in double object constructions, while postnominal possessors display affiliation with PP-recipients in prepositional dative constructions. Binding diagnostics furthermore indicate two distinct Small Clause structures for Greek possessive DPs, syntactically identical with the structure of ditransitives.